Parivartan empowers over 260,000 Retailers in India : Parivartan – a unique, retailer capability development initiative by Coca-Cola University (CCU), provides skills, tools and techniques to the rural and urban retailers in India for enabling them to make their business more profitable and sustainable. Since its inception in December 2007, this one-of-a-kind program, has trained over 260,000 retailers making it one of the largest and most impactful corporate initiatives for this population segment. The training delivered under Parivartan program is imparted through classrooms as well as on a mobile bus (CCU on Wheels) These customized buses reach out to retailers in rural and semi-urban areas and are fully equipped with basic training pre-requisites such as a seating area, presentation zone, audio-video equipment and on-board trainers. Retailers are trained on four key pillars: Shop Management, Stock Management, Customer Management and Financial Management. Trainers use multimedia tools including videos, leaflets and presentations to conduct the two hour long session. Training is offered in 6 regional languages through trainers certified by Coca-Cola University. The next level: The second level of Parivartan called Advanced Parivartan was developed with feedback from over 9000 retailers. The program was launched for retailers, who had already gone through the first version of the program. Advanced Parivartan includes modern methods of retailing including acceptance of credit cards and using computers, customer engagement and behaviour and basics of sustainability including recycling plastic waste etc. There are around 8 million FMCG retail outlets in the country, out of which Kirana (Mom and Pop) stores account for over 90% of the Rs.740,000 cr retail business in India. Parivartan is open to all retailers and not only retailers who stock Coca-Cola products. The program has reached out to 200,000 retailers in more than 4,500 cities across India. Focus on women empowerment: The Parivartan program has a special focus on women retailers, under The Coca-Cola Company's 5by20 Program to empower women across the world. Parivartan 5by20 training programs have been run in various cities across India with 'women only' batches. Hundreds of women retailers were trained on International Women's Day (March 8, 2014) across India. The program has also achieved a milestone of training 15,000 women retailers to date. Next steps: In view of the tremendous success of Parivartan, CCU has come up with a program extension - Parivartan E&D - for small-time Eating and Drinking outlets, more specifically the road-side eateries or Dhabas. 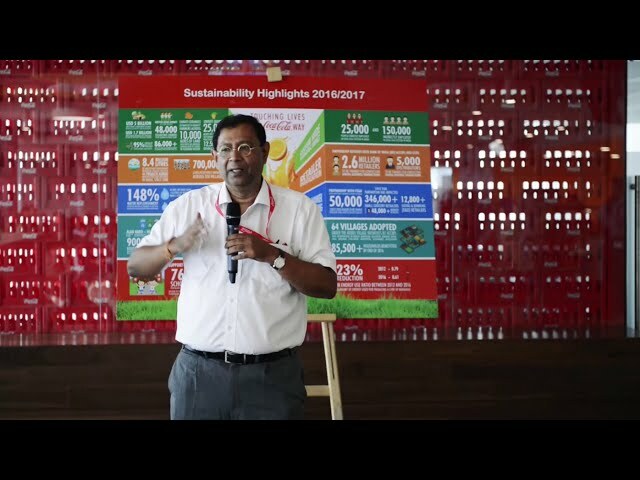 This program, apart from focusing on the critical success factors for such businesses - Hygiene, Customer Satisfaction, Branding & Activation and Customer Experience - also drives home Coke-food association by demonstrating financial benefits of combo offers and importance of Visi Cooler placement and purity. The pilot sessions for the Parivartan E&D program have been carried out across four cities and CCU plans to scale up the program reach within the current year.